The specs of Asus VG245Hhave designed by keeping in mind the requirements of the gamers. It is an entry-level gaming monitor which is capable of performing pretty much well in every possible aspect. It has low input lag, fast response time and supports FreeSync, which will ultimately help you avoid dealing with tearing issues while playing games with high graphical content. The monitor is a feast for the gamers. To enhance the gaming experience we will suggest you to regularly update your system’s drivers and display driver. 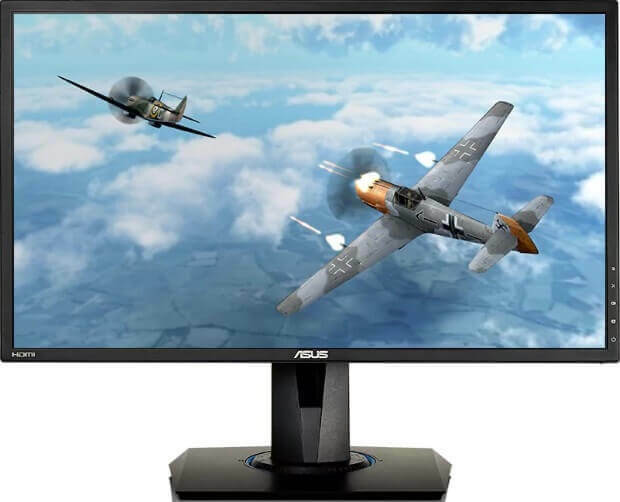 Asus has designed its VG245H Full HD monitor specifically for gamers. With a 1080p screen, ASUS VG245H is capable of providing unmatched performance while gaming, though it is an average monitor for mixed usage. The picture quality of the ASUS VG245H is average, and you will notice black images appearing as gray inside a dark room. Also, the viewing angles of the monitor are also very bad which makes the monitor perform well only for specific requirements including gaming. The monitor has a 75Hz refresh rate which makes it best suitable for gaming in comparison to the other 60Hz monitors. If you are looking for a budget monitor and will for sure look at the price tag before bringing a monitor home, then Asus VG245H has a lot of features to offer at an affordable price. 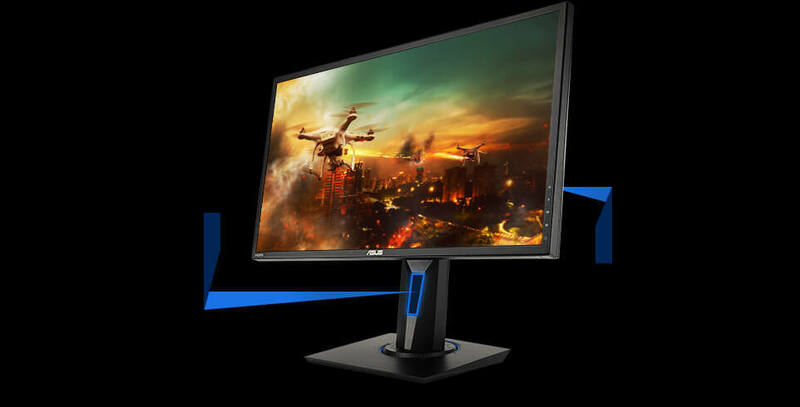 It is an entry-level gaming monitor with a vibrant color display and good refresh rate, making it a bit more responsive than its rivals in the market. Besides having an effortless easy-to-use interface, Asus VG245H also has AMD FreeSync support and some useful overlay features, making it the best gaming monitor under $200 range. Before we move to ASUS VG245H specs review, let’s have a look at its pros and cons. The Asus VG245H is one of the best entry-level gaming monitors that are available under $200. The monitor is a lot responsive as compared to its rivals and has an impressive picture quality. The monitor comes equipped with special features too. The design of the Asus VG245H is pretty much basic with little touches that have been introduced to keep the monitor both practical and attractive. The24-inch display of the monitor has some of the signature specsand features that Asus introduces in its specific gaming products. These are the sharp designs of the base and the etchings on the rear panel of the monitor. Also, Asus has provided a small hole which is at the stand of the monitor to keep the busy cables and wires manageable. The good thing about the design of the Asus VG245H is the adjustability of the monitor. Users or gamers will have the option to either raise this full HD screen or lower it down up to 5 inches respectively. Besides this, users can also tilt the monitor to 33 degrees backward or 5 degrees forward. It can also be swivel to 90 degrees to the left or right. Overall, ASUS VG245H has a good design as it has adjustments options that will let you keep the monitor at any angle or position you may wish. Also, its premium build quality with a sturdy display will hardly cause any problems while using it. Talking about the interface of the Asus VG245H, we can say that Asus has stretched its highly practical design up to the interface of the monitor. The monitor comes equipped with physical buttons behind the right side of the display which will let the users navigate the different settings inside the display. Also, with a small directional nub, switching to menus will be a lot easier than on any other monitor in the range available in the market.It also comes equipped withdedicated buttons that are used for switching display modes. Users can also use the buttons to activate special GamePlus features. Asus VG245H has two HDMI ports and one VGA port to connect a PC or a gaming console. Also, it has an audio-in and headphone jacks. The monitor has all the necessary ports which you may find it necessary for connecting both PC and PS4 or Xbox One at the same time. As already discussed, Asus VG245H has a very good refresh rate of 75-hertz that keeps the monitor responsive. Besides this, it has impressive colors that will enhance the gaming experience of the players. The 24-inch 1920 x 1080 screen of the monitor managed to provide a top-notch performance when we tested it against a number of gaming titles for single-player experiences and hectic multiplayer games. When tested against the Rise of the Tomb Raider on the display’s Scenery mode, we noted that the screen was filled with color, and looking at the bright-red coat of Lara Croft and the blue sky all above was just amazing. Throughout the test, we did not notice any kind of stuttering or lagging even when the character bounced from cliff to cliff or during the fight with the enemies inside the game. When we tested the monitor against another popular multiplayer title that is designed in a way that you can keep track of tons of on-screen characters at once, we noted that the Scenery mode and ultra-saturated RTS mode of the monitor helped us to distinguish between the blue units on the battlefield from the red ones. Besides this, attacking the enemies or launching special attacks were efficient and quick. With Battlefield 1 also the monitor managed to perform well on the required aspects. The green grassy plains inside the games looked amazing and rich. Also, the explosions that were happening all over the screen also kept us indulged. With this title, we also tested the FPS mode of the Asus VG245H and noted that the mode worked quite well in the game. But comparatively, the balanced Scenery mode was more enjoyable throughout the game. The game showed good frame rates without any lags or stutters while running and shooting. To achieve best performance out of your system we will recommend you to manually update drivers for your system. Talking about the calibration part, racing mode provides a good starting point for calibration. The users who are not willing to make adjustments to the system can choose the sRGB mode instead. The sRGB mode locks out the image controls and fixes output at 195cd/m2, while with racing mode, you will have the option to calibrate the settings as per your requirements. However, we will recommend you to calibratethe Racing mode to achieve od performance and results. It is not that all gaming monitors are equipped with decent speakers as they are quite rare on an entry-level display. Keeping these things in mind, when we listened to the sound that the built-in 2-watt speakers of the Asus VG245H produced, it was a pleasant experience. Though the bass of the speakers was not that much good and they were not booming out, the sound was clear enough to make us realize that when the enemies were approaching and helped us determine from where the gunfire and footsteps were coming. Talking about the image quality, it was decent, but you can easily find a better monitor for yourself with an IPS display and more vibrant colors at a similar price. The rivals of the ASUS VG245H have better viewing angles. One thing that is extremely good about the monitor is the response time speed. The monitor managed to provide a response time speed of only 1ms which you can rarely see on other premium monitors with IPS and VA. Being an entry-level gaming monitor, ASUS VG245H is pretty much affordable, and you can bring home the monitor at very less price. The monitor with 1080p display and FreeSync feature enabled justifies the price of the monitor. The best deal in the price is that it has a refresh rate of 144Hz. 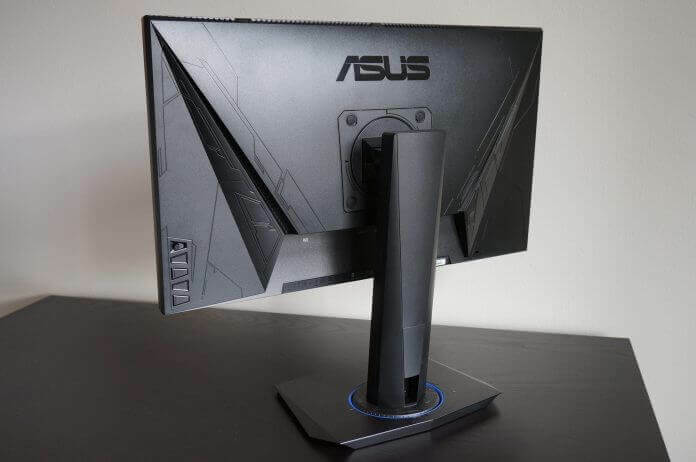 If you are looking to purchase the monitor from Amazon, then you will also come across ASUS VG245HE which is the same monitor as the former one, but it comes without the ergonomic stand. Check out the price of ASUS VG245H. Considering the price that it comes for, Asus VG245H is one of the best monitors available in the market. Its display is capable enough of providing high-quality images and fast response times. Also, the entry-level monitor offers such special features that you can notice on expensive models in the series. 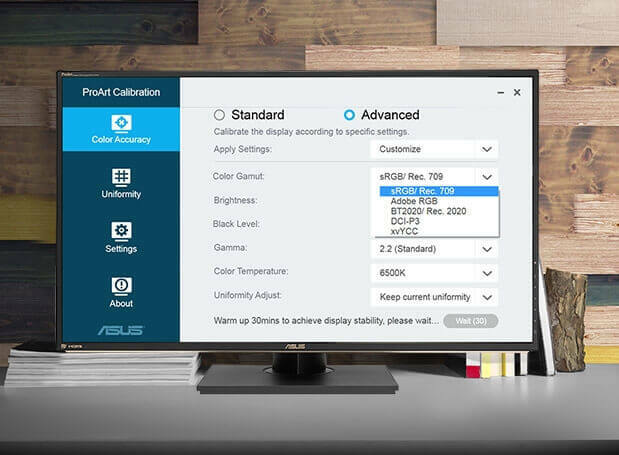 From the overall ASUS VG245 H review, we will say that the monitor has a good response time speed, but that comes at the cost of color quality (IPS), contrast ratio (VA) and viewing angles as the monitor lacks in the latter features. If you are willing to compromise on these part and looking for a monitor that can handle the ghosting and trailing artifacts of fast-moving objects in fast-paced games, then ASUS VG245H will be your best bet else you can look for monitors with IPS or VA panel such as BenQZowie RL2455.